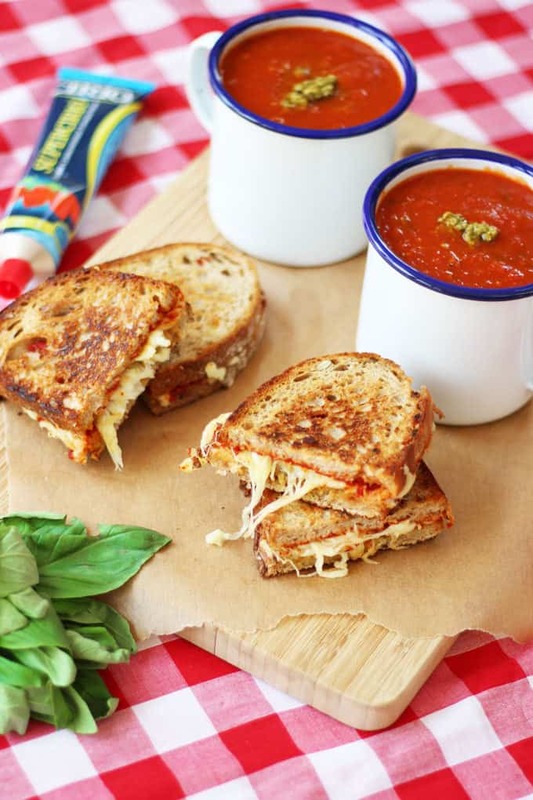 A simple, store cupboard Tomato Basil Soup recipe, paired with a delicious Pesto Grilled Cheese Sandwich. Easy to make in just 20 minutes. What’s your single most often purchased grocery item? You might’ve seen that I make videos of my shopping over on my YouTube channel. (Grocery hauls, yes, they are a thing.) It makes me realise how similar our food shopping is each week and a while ago it prompted me to try some new brands. As tinned tomatoes are one of the items I buy more than any other I decided to splash out and try a non supermarket brand. How different can they be I thought? Oh heavens, these tomatoes were like sunshine in a can. Their sauce was thick and bold, with plump nuggets of tomatoes nestling like jewels. I was imagining a vine in Tuscany just from the smell. Anyway, out of my daydream, I made a simple tomato sauce with them and IT WAS EVERYTHING. Where had you been all my life Cirio tomatoes? Who knew how different brilliant, quality tinned tomatoes can be? Since then they’ve worked their socks of in this kitchen, transforming bland bolognese and perking up pizzas. Then, HURRAH, by total co-incidence, Cirio got in touch with me to ask if I’d like to work with them and come up with some recipes using their products. Seriously, I think I need to get out more as I was very over excited. And, taaaa daaa, here we are, the first of four recipes I’m posting over the coming months using my life changingly good tinned tomatoes (okay, perhaps not life changing, but the only tinned tomato brand in my trolley these days). Now, I know, I know, people make recipe suggestions and we ignore them. But please believe me when I say, you do NEED excellent quality tinned tomatoes for this soup. The extra few pence they cost means no roasting fresh tomatoes to get the flavour out, therefore saving time and energy. Win, right? 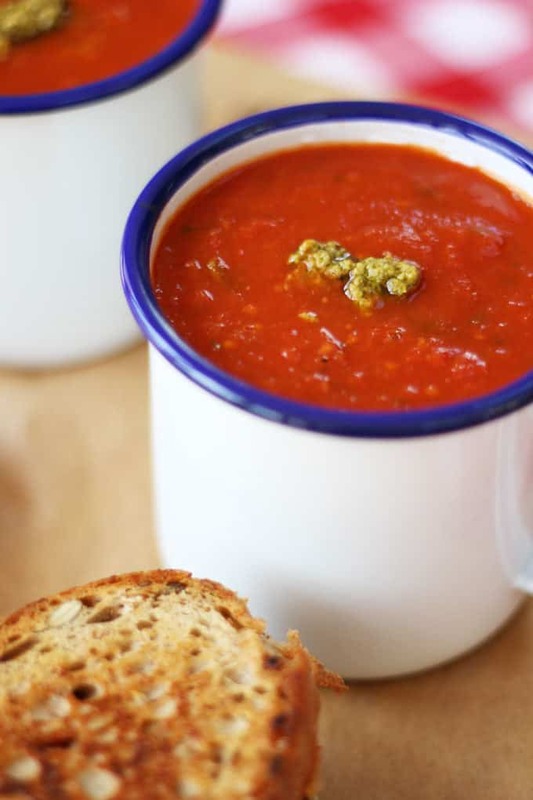 If you use the watery basics tomatoes, this will turn into a sad excuse for a soup. Please. Don’t do it to yourself. 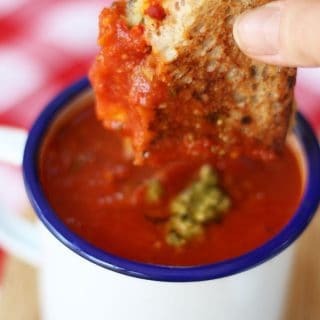 I used a combination of two cans of the Cirio Datterini tinned tomatoes and a can of the Cirio Pomodorini tomatoes for this Tomato Basil Soup. This is a great as a store cupboard stand-by, a favourite quick teatime dish or a light lunch. We often have it on a Saturday after swimming lessons. Perfect for refueling tired tots (and parents). 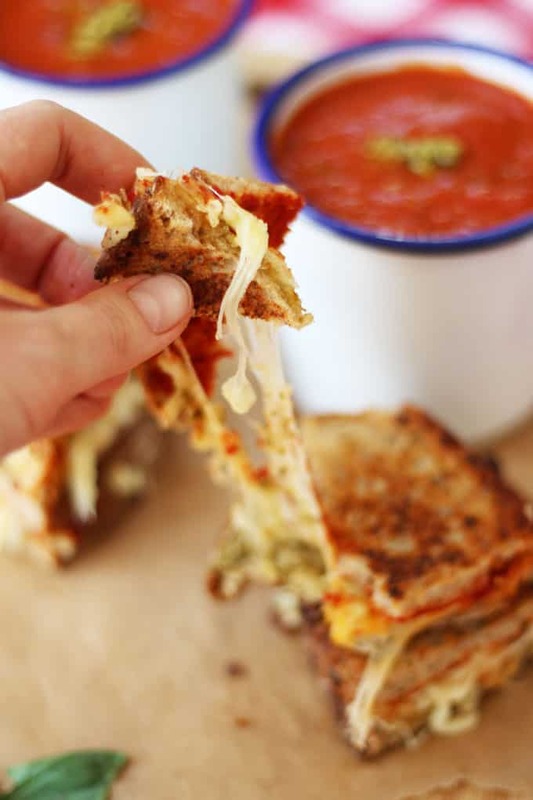 A delicious lunch option with homemade tomato and pesto soup with pizza grilled sandwiches with melted cheese. Gently sweat the onions and garlic with the oil in a saucepan until softened. Add the tinned tomatoes, vegetable stock, tomato puree, fresh basil leaves and salt and pepper. Pop the lid on and leave to simmer for 15 minutes on a low heat. 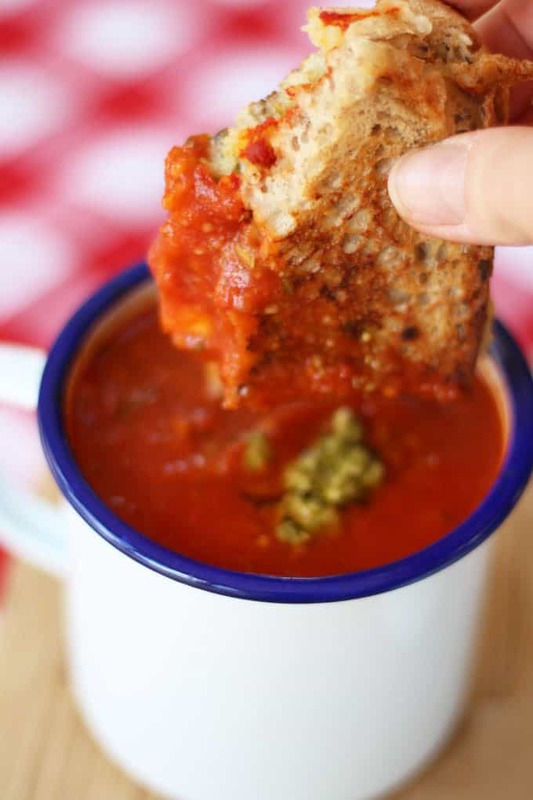 Meanwhile, spread 4 pieces of bread with the pesto and the other 4 pieces with the tomato puree. Sandwich together with the Mozerrella. When the soup is ready, blitz in a food processor or with a stick blender until smooth. Stir in the pesto. 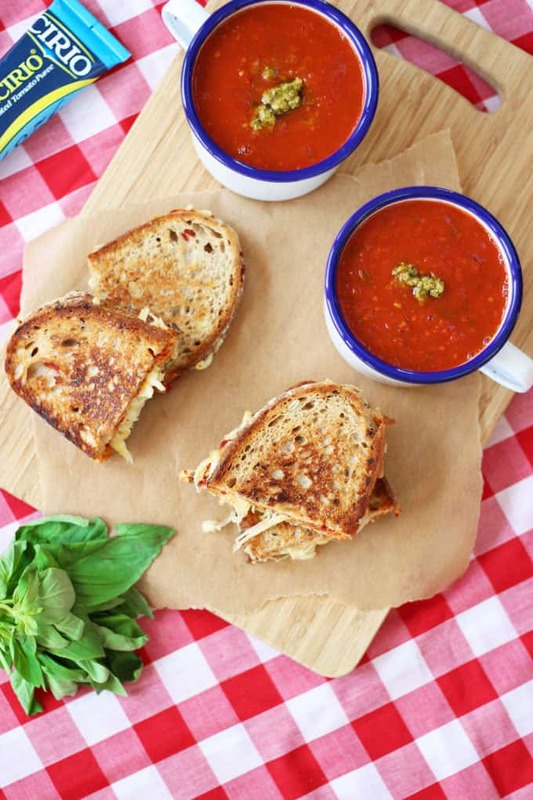 Serve the soup garnished with extra pesto and the piping hot sandwiches alongside. Hope you enjoyed this recipe, what’s your favourite store cupboard stand by recipe? What could you not live without in your kitchen cupboards?! Pin the Tomato Basil Soup recipe for later..
Disclosure: This post was commissioned by Cirio, however, as always, all opinions are truthful and I would never endorse a product I don’t genuinely love!